Temperature and humidity will have a substantial effect on the lifespan of your hardware. Almost all computers and servers have several temperature sensors for gathering component or ambient temperatures. Humidity sensors though, are often overlooked. With very few and inexpensive components, we can monitor both in Zabbix. 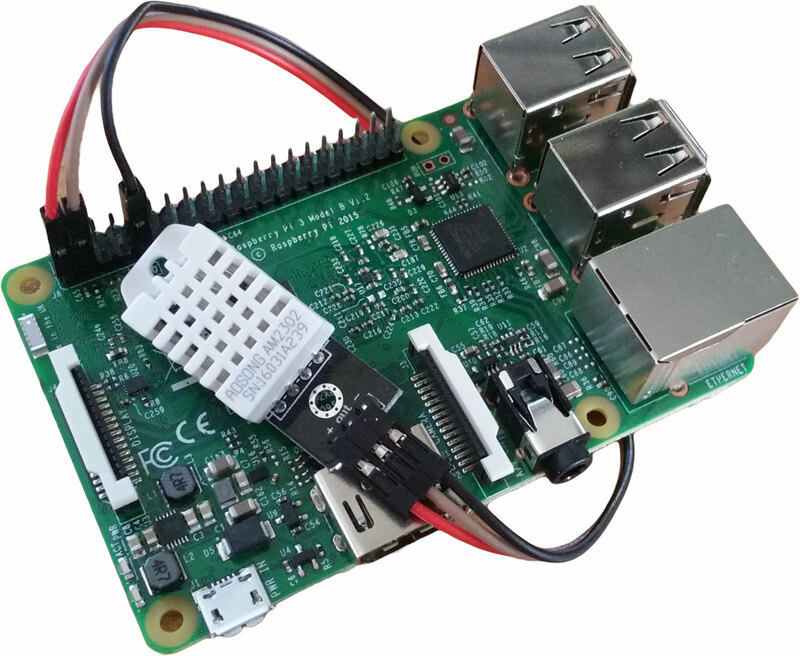 In short, we hook up an DHT22/AM2302 sensor to a Raspberry Pi 3, load Raspbian onto it, install the Zabbix Agent and configure it to pull temperature and humidity data through a small Python script. Although this can seem difficult to accomplish, trust me, it isn’t! All necessary components can be found at DX.com which also offers world-wide free shipping. The parts total about $83, the Raspberry Pi and power supply being the most costly at $69 combined. If you already have a Raspberry Pi or Raspberry Pi 2, these will do just fine. Any decent 1A+ micro USB power adapter, Micro SD card and SD card reader will also get the job done. This guide is written using a Raspberry Pi 3 with Raspbian Jessie Lite, Python 2.7 and Zabbix Agent 2.2.7 installed. 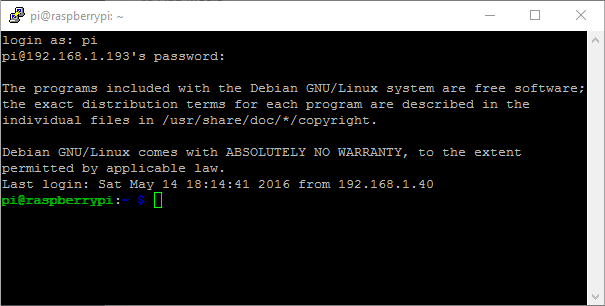 Open Win32DiskImager, select your Raspbian IMG file, select your micro SD card device and click “Write”. When finished, insert the micro SD card into your Raspberry Pi. Connect your Raspberry Pi to your local network with an Ethernet cable and plug in the power supply. After about 30-60 seconds, the Raspberry Pi is booted. To find the IP of the Pi, you can use a network scanning tool like SoftPerfect Network Scanner or similar. 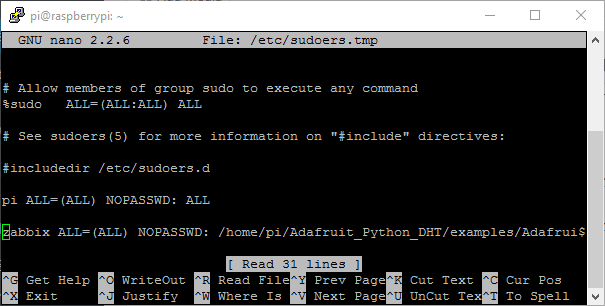 Connect to the Pi using the Putty SSH client. The default username is “pi” and the password is “raspberry”. With the Pi booted and ready to go, we now have to connect the sensor module. With the module, you also received a set of wires, red, brown and black. Red goes to the left pin, brown to the middle one and black goes to the right pin. The pins now have to be connected to the Pi’s GPIO pins, which is the two large rows of pins at the edge of the Pi board. Note, Raspberry Pi 2 and 3 pin placements are identical. You can take a peak at the top image, to see how I’ve connected my module. This ensures we have the necessary Python module compiled and installed, which enables us to pull data via the GPIO integrated circuit. The first argument denotes the model we’re using, the DHT22. The second argument is the GPIO pin # we chose earlier. The temperature received is in Celcius and the humidity is in percent. We’ve successfully pulled data from the sensor module. Let’s configure Zabbix Agent to do the same! NOTE: The “Server” parameter is used for whitelisting IP addresses you wish to allow communication with the Zabbix Agent. For testing purposes, we’re using the default of “127.0.0.1” which means we can ONLY communicate with the agent locally. This parameter will need to be configured to the correct IP address of your Zabbix server when you wish for the server retrieve data from the agent. Ctrl+X to quit, “Y” to save and then <Enter>. NOTE: Some might experience longer than usual polling time when querying environment data from the sensor module. This can result in the Zabbix Agent UserParameter script timing out. To circumvent this issue, you can increase the configuration parameter ‘Timeout’ from the default of 3 seconds, to 5 seconds instead, or longer if necessary. At last, we are now ready to perform the final test. The agent item key we wish to pull is “dht.pull”. 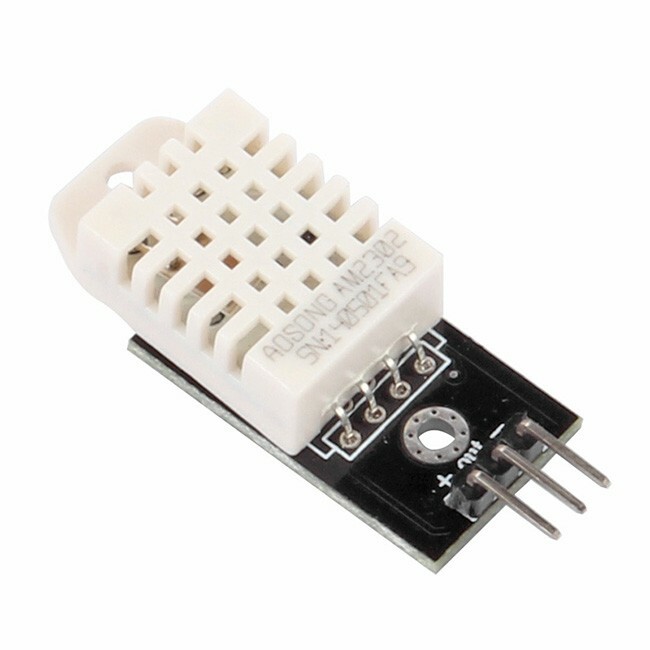 It has two parameters we can choose from; “2” to retrieve temperature in celcius and “4” to retrieve humidity in percent. We’re done! We can now easily pull data about environment humidity and ambient temperature! The Raspberry Pi could now be placed at a remote site, to monitor the environment there. This would then enable you to receive an alert of any sudden fluctuations in temperature and humidity happens! Additionally, I’ve created a small template that pulls temperature and humidity every 60 seconds. Get it here. Feel free to leave a comment, if you have any tips or suggestions for this guide! Great article! I’ll test this solution. Can you believe that we can use this on a production environment? When testing it, it seemed precise enough, but I would expect it to be maybe a few degrees off. We plan to use it for spotting sudden fluctuations and to gather history data, not for precise measurements. Don’t rely on it for anything. Use it as a data gathering tool and have redundancies for environmental monitoring. Where we are hosted, already has monitoring. We just don’t have access to that data unfortunately, so we have to be creative! This is what I have been looking for! Remote sensing of temp and humidity in a unix/raspi environment. 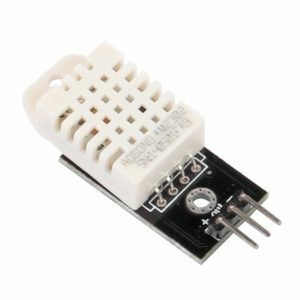 Would it be possible to hook up several sensors to the same raspberry pi? As the DHT22/AM2302 module requires a 3.3v connection, by default you should be able to use two of them on the same Raspberri Pi, without any additional tinkering. The GPIO 3.3V rails do allow for multiple modules, so you could DIY or maybe with an expander module. Thanks for the great tutorial… I have my Raspberry Pi all configured and working. I am however, having some difficulty getting this setup on my Zabbix server to generate alerts. I imported your template successfully into Zabbix frontend and linked it to the newly created RaspberryPi host. From here I’m pretty lost on how to get the alerts working. I can see the Ambient Temperature and Humidity entries under the “Items ” tab in Host -> Configuration, they are both enabled. I’m assuming I need to create a trigger at this point? I’m very new to Zabbix, so learning as I go along. Would highly appreciate it if you could point me in the right direction. Yes, you do need to create a trigger! Triggers, essentially, simply check if something is True based on the criteria you set up. That is what I was looking to monitor temperature and relative humidity in my small sever area under stairs. Thanks for very useful instruction to monitor humidity and temperature by Zabbix, but I have a problem I added the template to my Zabbix server and defined Raspberry as host and also, change server in zabbix_agent.conf but It does not receive ant traffic from host. Would you please help me in this regard? 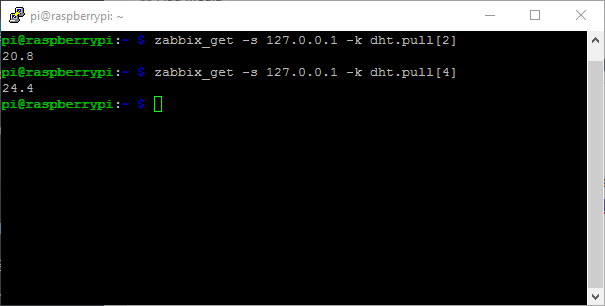 List of comma delimited IP addresses (or hostnames) of Zabbix servers. Spaces are allowed since the Zabbix 2.2 version. If IPv6 support is enabled then ‘127.0.0.1’, ‘::127.0.0.1’, ‘::ffff:127.0.0.1’ are treated equally. Also, if having issues, you can set DebugLevel to 4 to see why your agent is denying you access in your log file. Remember to restart the agent after having made changes. It was solved, but something makes me confused because pulling humidity and temperature is working for a while and after that Zabbix send an error I could not execute shell script. After some minutes again working. Regarding your issue, you probably need to increase your Zabbix Agent “Timeout” parameter in the config file to something like 10 seconds to be safe. That should solve it. Thank you very much for the great tutorial to monitor humidity and temperature by using Zabbix monitoring system. 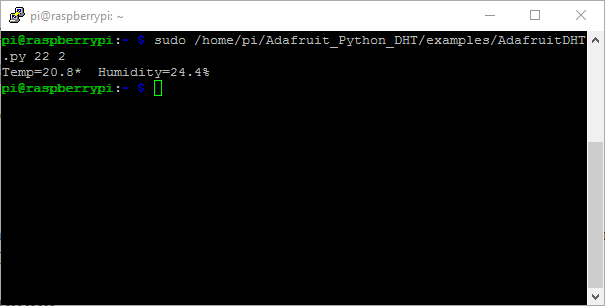 I use Raspberry Pi 3 and DHT22 2302 sensor and all configured and worked well. If you’ve followed the guide and imported the linked template, as well as added your Raspberry Pi host to your Zabbix setup, simply add the template to the Raspberry Pi host and Zabbix will begin collecting data. After a short while, you can access the gathered data via “Monitoring -> Latest Data”, search for your host and view the data here! According to your screenshots, you’ve added the template to your host, so I believe you should be gathering data correctly. You can check for that under “Monitoring -> Latest data” via Zabbix Web UI. You are correct that there are no graphs, triggers and screens in the template. You will have to add those yourself. is this due to this? Then add the other line as described and it should work. Great article, but I would like to know if you can show us how to configure zabbix server to get data from raspberry (zabbix agent), thanks! 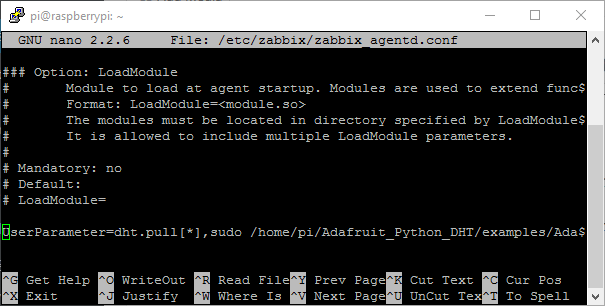 If you can install the Zabbix Agent on your Raspberry Pi, it will behave like any other agent, and you should be able to pull the same data from it. I might do a post on how to quickly set up a simple Raspberry Pi agent, or maybe even a Zabbix Proxy, for gathering info from remote locations. Could you please help me? I do not know where to look. I have checked everything fre times. This is probably due to the check timing out. You can increase the Zabbix Agent configuration parameter ‘Timeout’ from the default of 3 seconds, to 5 seconds instead, or longer if necessary. The option can be found in the ‘/etc/zabbix/zabbix_agentd.conf’ file.